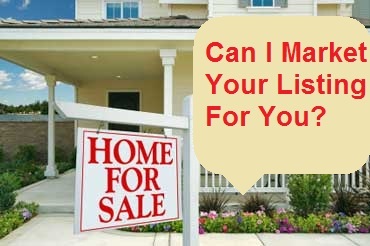 If you don’t have any listings it doesn’t have to stop you from reaping some of the benefits they offer, which includes them generating leads and helping you make sales. Here’s how you can do it. Partner with another agent in your office by offering to help them market one of their listings for a percentage of the fee if you’re the reason it sells (you sold it through another agent, a buyer saw your advertising and bought it through you’re the agent you’re partnering with, a buyer saw your advertising and bought it through another agent in your office, etc.). Of course, if you sell it directly to a buyer it goes without saying that you’ll be entitled to receive the full percentage of the selling agent’s commission split that’s customary in your area, which is typically 50% in most areas that I’m familiar with. After you have a written agreement in place, and it should be in writing to avoid misunderstandings, start marketing the property like your life depends on it. Make and distribute flyers, host open house events of the property, make and post videos, do a direct mail campaign, create a Facebook Page, and find some free to low cost places to advertise it. Another idea is to advertise it on this website. For best results think of it as a single page website where you give a full blown description of the property. Begin by telling the story of the home to elicit an emotional buy-in reaction from potential buyers and engage their interest. People love knowing about the history of the homes they buy and live in, so why not give them a full dose of it. Include a description of how close the home is to major shopping, grocery stores, the airport, etc. Is the home zoned for good schools, or do the owners children go to private, or charter school. Summarily, many new agents are lock brained into thinking that the only way they can make money on a listing is if it is theirs, but now you know differently and that with this idea it’s not required. In fact, once you’ve done your first one I’m pretty sure you’ll be ready to repeat it all over again as fast as you can.